signs and is stringing them together to communicate in new ways. Today he signed “Body Amazing Time Thirsty” and then signed “drink milk please”. He signs “Potty, wipe, flush, wash” when someone else goes to the bathroom. Potty Time is helping him make more connections and communicate about his world- yet another step toward independence and potty training. Our path will no doubt be easier and filled with more fun and songs because of Potty Time. Thank you!! I loved this testimonial because it shows how much power a little language can have. I followed up with Denille to hear more of the story and this is what I learned. 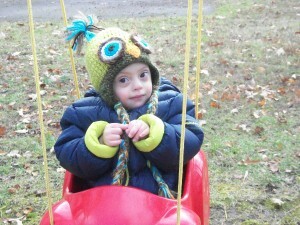 A few hours after Quinn was born they found out that he had Down syndrome. 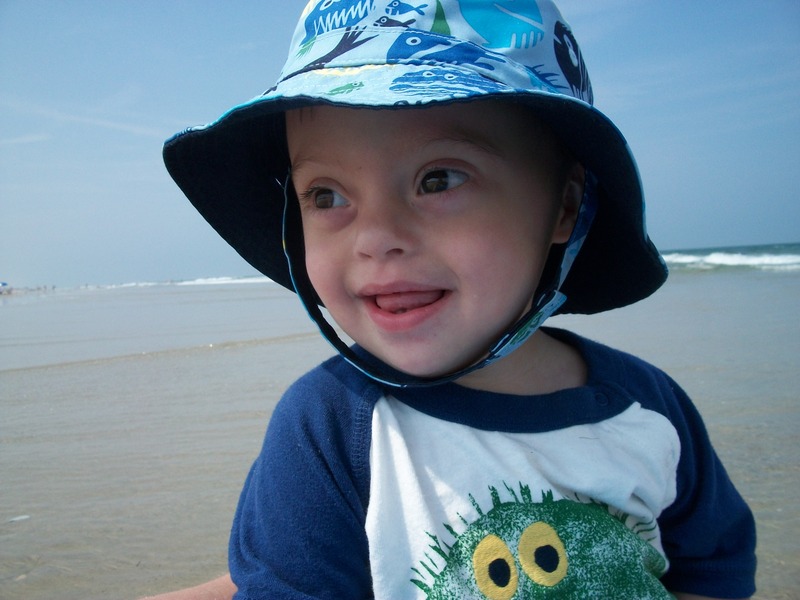 They had heard that signing with children who have Down syndrome is beneficial and so when he was about three months old they purchased the Baby Signing Time series. By six months Quinn was signing EAT… but he used it for everything! Today the family owns most of the Signing Time collection and Quinn can recognize most of the signs and copy them independently and he independently initiates about 75 signs. When you figure out what it is he is signing he wants he will sign YES and cheer for you. In regards to Potty Time, Quinn is also signing, “Uh-oh, it’s an accident” and his favorite song is “Celebrate” and he will sign TIME, MUSIC, CELEBRATE or TIME, MUSIC, and clap. He will copy the motions in the video, including running around and jumping up and down and is even doing the motions a couple of seconds ahead of the video. Quinn loves Potty Time so much he has been known to rock the car dancing in his car seat to the CD while at a stoplight. Colleen’s note: As for actual potty training, well right now Quinn is scared of the potty, but he’s looking at it, and certainly getting the vocabulary and the exposure. He’s not ready yet, and that’s perfectly okay. All children do things in their own time, and a child with special needs may need even a little more time or a special approach. What really struck me about Quinn’s story was how much he was grasping the vocabulary and concepts, and what a happy little guy he was when interacting with Signing Time… something that just made me smile inside as I read his mom’s initial testimony and then later listened to her story on the phone. Giving kids the power of language, and laying the foundation for future skills is an incredible gift. We never get tired of hearing how Signing Time is helping to do that. Thanks to Denille for sharing her special story! This entry was posted in General and tagged ASL potty trainings, baby signing time, celebrate, colleen, parenting, potty training boys, potty training girls, potty training method, potty training resources, potty training special needs, routine, sign language potty trainings, signing time, toilet training by colleen. Bookmark the permalink. I love this post. My son is 14 yrs-old with DS and autism and still not completly pooty trained! I want to shared this with others moms! Aidan is eight and still not quite potty-trained still has lots of accidents…but he signs bathroom when he starts to go… getting closer. Hi Cindy – thanks for sharing! The fact that he is signing is great! Identifying and communicating his actions is a huge step in the right direction! my son has downsyndrome and is 5 and has been working on potty training for awhile. he will go pee sometimes but never the other one. i wish i had more suggestions on what to do for him to get potty trained.